The United States Securities and Exchange Commission (“SEC”) filed a complaint in federal district court and obtained a successful result against one or more of the defendants. As a result, an SEC whistleblower reward became available. Two separate individuals submitted applications for SEC whistleblower rewards in that Covered Action. The SEC’s Claims Review Staff (“CRS”) issued a Preliminary Determination granting an award to one of them, but applied an SEC whistleblower award reduction due to that individual’s own role the underlying misconduct. The Claims Review Staff denied the award application filed by the second claimant. The Commission entered an Order Determining Whistleblower Award Claim in which it adopted the CRS’s recommendations as set forth in the Preliminary Determination, including the recommendation to impose an SEC whistleblower award reduction. The Order revealed that there was a judgment entered against the first claimant (the “whistleblower”) in some action, the name of which is redacted in the Order. Because the Order was heavily redacted, it is not possible to determine whether the whistleblower was found liable in the SEC’s case, or whether it was in a related case brought by some other governmental, regulatory, or self-regulatory agency. The Order did mention a “Related Criminal Action”. However, as of the date of the Order, under the SEC whistleblower rules people criminally convicted for frauds related to the ones they reported to the SEC were ineligible to receive SEC whistleblower awards. It therefore seems likely that the action in which the whistleblower was found liable was not that “Related Criminal Action”. 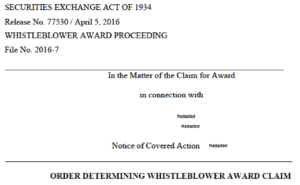 According to the Order, the SEC Claims Review Staff’s Preliminary Determination informed the whistleblower of the potential SEC whistleblower award reduction. By not filing an objection to the Preliminary Determination, the Commission deemed the whistleblower “to have consented to the offset and to have waived any opposition” to the SEC whistleblower award reduction.